The second largest salt water rapids in the world, Skookumchuck Rapids boils as huge volumes of water force their way through Skookumchuck Narrows at the north end of Sechelt Inlet. Skookumchuck means ‘strong water’ or ‘turbulent water’ in Chinook. The flow of the rapids can reach up to 16+ knots in spring and summer during the greatest tide changes. 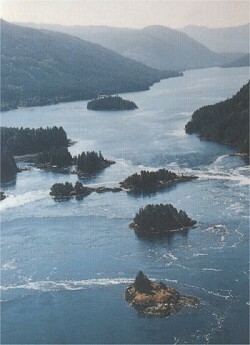 On a 3 metre tide, 200 billion gallons of water flow through the narrows connecting Sechelt and Jervis Inlets. To fully appreciate the power of the water your tour should be scheduled to the larger tides. For rugged beauty and power an ebbing tide is preferred. 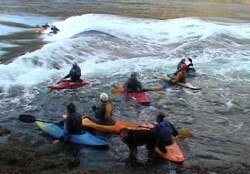 Kayakers are drawn here to experience the awesome, class 5 rated standing wave ocurring on a large flood tide. 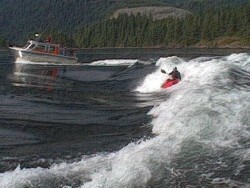 This is 1 of only 2 waves of this class in the world. Almost every large flood tide through the summer will see an increasing number of brightly colored kayaks. Slack tides in the narrows offer a brief window for boats to navigate through to the other side. Low slack is a great time for exploring the intertidal areas. Caution is advised here as the water seldom ever attains true slack for more than moments. Slack is also the time for divers who wish to experience a dive that rates high in the top 10 dive locations in BC. Tour is 30 minutes and scheduled for the best viewing times. Please add GST (5%) to all prices. © High Tide Tours 2016 | Website in collaboration with Pod Creative.